Sounds like a directive. Right? At almost every GGA school I attend, lots and lots of students are doing their level-best to achieve the Single Plane Swing model. But many, if not most suffer because of two important missteps. They practice too quickly. And they PLAY the game too slowly. Interestingly, these are not execution missteps (caused by lack of focus or an inability to understand a strategy)…they are mental game failures. Let me explain, first with the concept of Practicing Slower. One simply cannot groove and assimilate new body positions without this kind of work. 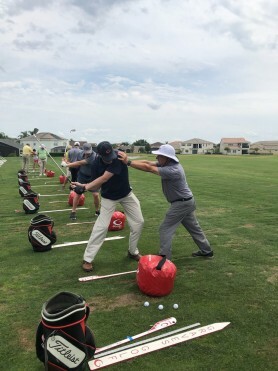 Just last week I heard Todd tell the story that when Master Instructor Chandler Rusk was converting from conventional to the Single Plane Swing, he was known to spend hours on the practice range working on one thing: perfecting his move into position one. Why won’t most students spend their practice time like this? One word: The EGO. It’s more satisfying to the EGO to hit ONE great shot every once in a while rather than spend the time needed to master a position or two. In other words, even though it is a rational-enough concept (practicing slowly during your swing development), it is much harder to do because a part of your brain wants to “show the world” what you are capable of. This requires cultivating the awareness that your EGO will try to sabotage a regimen like this. It requires that you learn to tune into your mental and emotional tendencies…and be disciplined enough to stay on track with the deliberate, deep practice that will yield the changes you are looking for. Dan Coyle wrote about this in The Talent Code…and Todd and Tim refer often to the research and insights from Coyle’s work. Skill development comes from deep, deliberate, proper practice. When it comes to playing the game, most players play too slowly. Specifically, they tinker and hover too long over the ball when they are hitting their shots. This causes paralysis by analysis – and yes…this is an actual technical term. The antidote? Play faster. Stop lingering. Pull the trigger over your shots sooner. This will prevent over-thinking and will allow you to play golf more as a reactionary sport…and you will be able to execute shots up to your talent level, not BELOW your talent level. So if you want to get better this year, do yourself a favor and tune up your Mental Game skills: create a discipline to practice slower when off the course, and to play faster when on it. Should you also putt in the four to seven second window? Your info is great hope to attend soon!! Hi Bill! This is all very personal…but I never need more than seven seconds on a putt. (From the time I set my putter down behind the ball til when I pull it back.) You have to find a repeatable routine for yourself. And remember, the longer you dwell over the ball, the more apt you are to engage your thinking brain…and that’s when doubt, fears and anxiety can creep in.